The results of the tender to supply the Indian Air Force and Army with 197 reconnaissance and surveillance helicopters are expected to be announced soon. All the test phases have been completed and the examination of bids is at final stage. JSC Rosoboronexport is hoping that Russia’s Kamov Ka-226T multi-purpose helicopter will win. 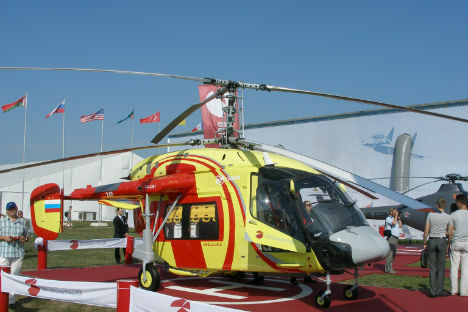 Its rival is Eurocopter AS550 C3 Fennec helicopter. A distinct advantage of the Russian bid is its "cumulative" effect: the superior Ka-226T chopper is offered together with an offset program, which is attractive for the Indian side. First, under the offset program, Rosoboronexport, with the participation of Russian Helicopters holding’s enterprises, proposes to establish joint production of subsystems and components for the Ka-226T, followed by the assembly of these machines in India. Second, the joint development of new Ka-226T versions is offered. And, third, this program will enable the two countries – strategic partners – to go to full-scale industrial cooperation on helicopters. Russia’s vast experience in this area and the successful implementation of joint programs in the aircraft field (licensed production of the MiG-21, MiG-27, Su-30MKI fighters in India,) are a good base for realizing the most ambitious goals. Thanks to its coaxial rotor system, the Ka-226T has a large reserve thrust and a high climb rate, which increases its hover ceiling. The aerodynamic symmetry and lack of cross coupling in the control channels simplify piloting the helicopter, which is especially important when flying at low altitudes. Such a machine is more maneuverable over the entire range of flight speeds. The Ka-226T is ideal for handling missions in mountainous terrain and at high temperatures. Two modern Turbomeca Arrius 2G1 engines having a sufficient capacity, which is critical in the highlands and hot climate areas, provide the flight performance and a high level of survivability of the Ka-226T, in particular. Even with one of its engines damaged or failed, the helicopter will be able to continue flying with one of them. Ka-226T showed it excellently during the evaluation trials conducted within the tender earlier in India. These tests clearly demonstrated that the Ka-226T had embodied the best Kamov design school achievements: modularity making the helicopter truly versatile, easy piloting technique, low vibration, high reliability, flight safety and low maintenance.